Condensed phase combustion applications necessitate not only the accurate modelling of the combustible material but also of any materials that surround and interact with it. To this end, at the core of our work is the development of numerical methods for the direct numerical simulation of a combustible material (e.g., gaseous, liquid, solid, explosives, ideal and non-ideal explosives etc.) and its non-linear interaction with an arbitrary combination materials (gas, liquid, solid and plasma). We develop models for the accurate modelling of complex, combustible materials and their non-linear interaction with an arbitrary combination of other materials. The modelling of complex, combustible materials requires non-trivial mathematical models and realistic equations of state and reaction rate laws. Our work focuses on selecting the appropriate formulations, equations of state and rate laws from the literature or devising new ones to describe the combustion phenomena realistically. Once the mathematical and numerical environment is in place, focus turns to the application, e.g., explosive reactive armour, rate-sticks, impact and detonation etc. We have a hierarchy of models that we use based on the physical complexity of the explosive in the application (see Multiphase modelling). Moreover, the simulation of the non-linear interaction of the explosive with other materials is done in a multiphysics framework. 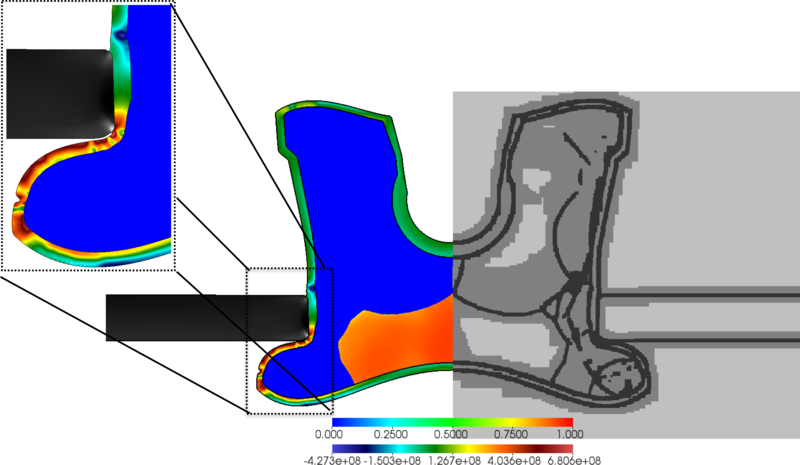 Traditionally, solid-fluid problems are modelled using a one-way coupling of finite element and CFD codes. The two processes are solved in a 'co-simulation' environment, each on its own grid, with a distinct numerical method. This may lead to discretisation errors passing from one method to the other. Our work focuses on the two-way coupling of the equations in a regular Cartesian mesh, implemented in our structured, hierarchically adaptive mesh-refinement framework. We applied our multi-physics technique to a sandwiched-plate impact scenario. A cylindrical flyer plate impacts the plate and the subsequent response of the explosive residing behind the target plate is studied. The effect on the ignition of the explosive is compared in the cases where there is or isn't a rear steel plate covering the explosive. The steel plates and impactor are modelled by the elastoplastic equations and the explosive by the MiNi16 formulation. This is an example of a high-speed impact involving multiphase reactive flow (explosive), elastoplastic structural response (solid) and inert air response. The vessel and impactor are modelled by the elastoplastic equations and the explosive by the MiNi16 formulation. The impact generates the detonation in the explosive. 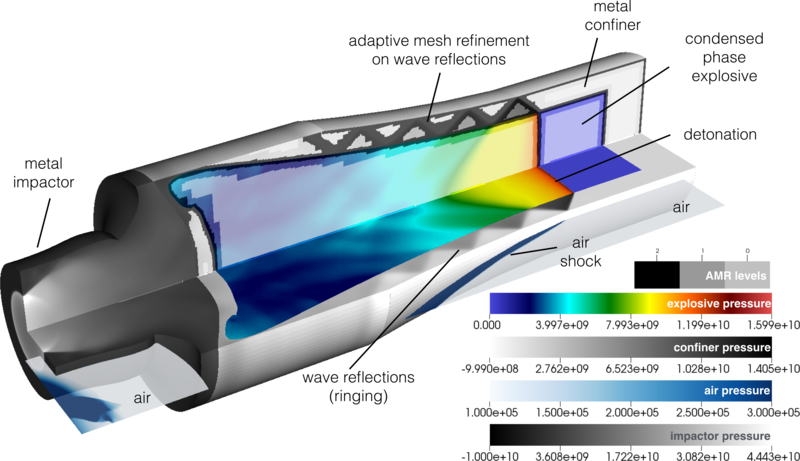 The interaction of the detonation wave with the copper generates wave reflections at the inner and outer vessel walls and thus waves are transmitted into the air and back into the explosive. This is a low-speed impact example involving reactive flow, elastoplastic structural response and inert air response. The steel tank is filled with a gaseous explosive and its impacted by a steel projectile at the speed of a head-on car collision. After several reflections, the waves generated in the gaseous explosive upon the impact lead to the generation of several ignition sides, which eventually coalesce. S. Schoch, K. Nordin-Bates, N. Nikiforakis. 2013. “An Eulerian algorithm for coupled simulations of elastoplastic-solids and condensed-phase explosives”, Journal of Computational Physics, Volume 252, Pages 163–194. S. Schoch, N. Nikiforakis, B. J. Lee, 2013. “The propagation of detonation waves in non-ideal condensed-phase explosives confined by high sound-speed materials” Physics of Fluids, Volume 25, Issue 8, http://dx.doi.org/10.1063/1.4817069. S. Schoch and N. Nikiforakis. 2014. "Numerical modelling of underwater detonation of non-ideal condensed-phase explosives." Physics of Fluids 27, 016101 (2015); http://dx.doi.org/10.1063/1.4905337. S. Schoch, N. Nikiforakis, B. J. Lee, R. Saurel. 2013. “Multi-phase simulation of ammonium nitrate emulsion detonations”, Combustion and Flame, Volume 160, Issue 9, pp. 1883-1899.